Summary: Befriending Traci Calloway Cole is the best thing Simone Phillips has ever done. Traci is the kind of woman Simone wants to be-in every way possible. She begins copying her role model. Not because she wants to be Traci. She just wants to be exactly like Traci. Traci doesn't worry, though. She knows Simone doesn't mean any harm and that her mimicry is only sincere admiration. Until she discovers how far Simone's obsession has gone. It is then that Simone's entire world begins unraveling, and dreadful secrets from her past are exposed with no warning. Secrets that she'll do almost anything to protect. 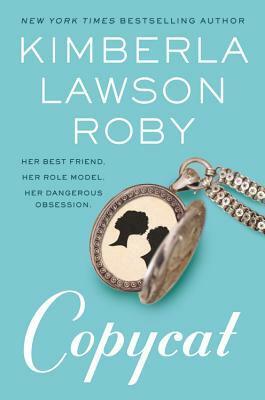 Review: From the very beginning, Copycat felt familiar and that's because Kimberla Lawson Roby continues to stick to her tried and true, simplistic plot lines and story telling. Much like her 2011 Secret Obsession, Copycat is predictable from page one. As a reader, I felt like a movie patron that screams at characters on the screen to, "Get out! You're in danger, girl!" But the characters didn't heed my warning and, instead, readers are subjected to 192 pages of meh. When I read 2016's Best Friends Forever, I swore I would never read a Lawson Roby book again. The flat characters mixed in with one dimensional characters and weak story lines continue to be a theme in Lawson Roby’s work. After all of these years, and books, one would think that there would be progress with her writing. It continues to be formulaic and predictable. I know that her books sell well, but that says more about lazy readers than it does about her writing. I would imagine that the bulk of her faithful readers are the same people that shill out money to watch Tyler Perry’s gun toting, foul mouthed, wisdom spewing Madea. I can honestly say that this is the last Lawson Roby book that I’ll pick up. And yet here I am again. Nothing has changed. Her writing still falls flat and I'm still unimpressed. No more, I say! No more!